Tank was supposed to be ready by noon yesterday. I heard nothing from the garage. Attila called them when he got back from work, and they said they just had to check it out to make sure everything worked, wanted us to come get it the next day, Friday. Attila told them his wife would like it today, Thursday, and that we would be at the garage at 5 p.m. to pick up Tank. When we got to the garage it was very busy, and Tank was nowhere to be seen. We greeted the desk staff, who said that it wouldn’t be long. Then we saw Tank arrive back from the test drive. We waited patiently. We watched as Tank was driven off the lot again, alerted by the terrible noise she was making as she drove away, she sounded like a diesel truck. Tank does not have a diesel engine. Not good. They explained something about two cylinders not working, they were working when she came to the garage, now they are not working. Not good. The fellow told us Tank will be ready today. When we were there I decided to take charge of the interactions, after all I am here during the day, so I can call them. Actually I am the “bad cop” when we approach situations like this, a role I can easily assume. I pleasantly but firmly told the fellow that if Tank were not ready by Monday morning, they would HAVE to provide me with a courtesy car. I asked that I be called today to let me know what is going on with the vehicle. It was just after 1:00 p.m. and I hadn’t heard from them yet, so I called them. They are ordering parts directly from the dealer he said. No word on when the vehicle will be ready. They will call me this afternoon to keep me up to date on how things are going. At least no empty promises were made. It is hard to remain optimistic about this situation. These guys are clearly in over their heads with this repair. I think they will try to make it right, but my GOD this is getting ridiculous. I had a very bad experience with a garage when I was doing research for my PhD and needed a vehicle. The garage was awful, wanted a fortune to return the vehicle, not having fixed it. I took them to small claims court and won, and since they were a franchise I called the mother company. I did not let that one lie. That garage lost their franchise, and I didn’t feel in the least bit sad about that. The consequences of the lost vehicle were catastrophic for me. It wasn’t until this morning that the bad feelings about that past fiasco resurfaced. This situation is going on way too long for comfort. Feeling so tense, so irritable, what to do! I had saved all the apple peels from the 26 Northern Spy Apples that I used to make and can applesauce. They had been boiled until transparent, then strained. The liquid sat all day yesterday, I was too distraught to function in the kitchen. I did boil it for five minutes though, since it was sitting on the range for the day. This morning I made Applescrap Jelly with it. It is so good! 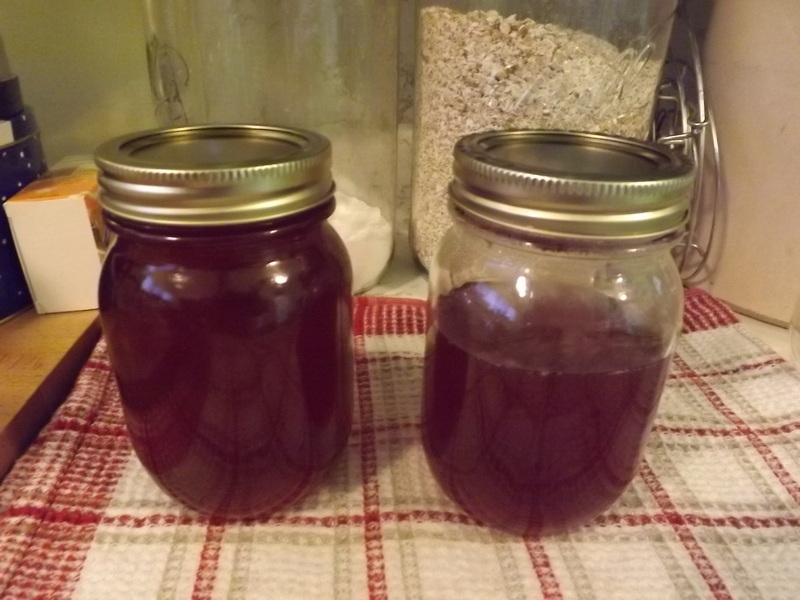 I used the Apple Jelly with no pectin recipe from the National Centre for Home Preservation, and included the lemon juice. When the liquid was first strained there were eight cups, which were boiled down to four cups. The jelly had to cook for around twenty minutes to reach the sheeting stage, and it seemed as if it was not going to jell, but finally it did. The yield was small, but oh so good! Applescrap Jelly made with no pectin. Thank goodness for the new steam canner, which makes canning this wee bit of jelly perfectly viable. Both jars sealed as soon as I took them out of the canner. The partially full jar will go into the refrigerator to be used right away. You have been far more patient than I would have been. I hope Tank gets back to you soon. Birdie, well I think I am much calmer on screen than I am in real life, lol. Somehow typing out the situation has a calming affect. I am not optimistic about getting Tank back soon, they called late this afternoon to say she probably needed a new solonoid, and then what who knows. This garage has a reputation of being honest, which is hard to earn in a smallish community, so I am going to trust that if they say Tank needs something, she does. She is 11 years old, and her previous owner obviously pushed her hard (off road kind of stuff, she is a tough customer), so it makes sense that the pushing would have consequences. Sigh. Maybe she will be back next week. In the meantime I will be cancelling and/or resecheduling all of my appointments for the next few weeks, just to relieve the stress I am feeling. Joan, it is ridiculous! I am becoming resigned, that it isn’t going to be resolved easily or quickly. It is easier to tolerate if I feel resigned. I am determined to find the other side of this though, to get my appointments rescheduled, and move on once this gets resolved. Excellent advice in your title for us, too. Here it is almost midnight and after changing a battery on our thermostat we’re realizing the problem wasn’t the battery. Our heat is coming on only a few minutes at a time and not maintaining the set temp. We had it set at 74 and just now saw it was at 69. Too late to call anyone. Fortunately, we set the night temp at 68 – although I’m sure it won’t be maintaining that, either. Good thing DH is a furnace at night. Keeping the bedroom door closed, we should be reasonably warm tonight. Hope you get your car back quickly and in good shape, Maggie. Hahahahaha! They have to order a part. Yes, that is what they said. And the story goes on and on. We shall see what transpires, just what all this part ordering is about, when the bill is presented to us. So far they discussed one increase in the bill with us, so I am interested in seeing if they are going to try tacking on a whole lot more without letting us know how much it will cost. We have another garage that we could have gone to, depending on how this transpires, we might be giving them a try in the future! The furnace may be able to maintain a lower temp of 70, the furnace guy says, so that’s what we get to set it at for now. I’m wondering about the cost as he was here for an hour and half on a Saturday (and still didn’t fix it) and now we’ll get to pay for new time and a part with no guarantee that it will fix the problem. Teri, glad to hear you have some heat! Service is going to be the MAIN thing I think about for every purchase from here on in. Finding a company that will do right by their product/service is getting tougher all the time. I should have known when the first mechanic wouldn’t fix Tank that we were in for a ride. I hope there is a reasonable outcome for your furnace, and for my vehicle! You might need to discern what your mechanic is capable of doing, ie work that is basic parts vs work that requires specialized tools for computerized components. The furnace wasn’t able to maintain the temp for the night, it went down to 66. The bedroom was warmer than that because the door was closed, though. We’re finding we can fool the furnace into running by things like opening and closing the cover of the thermostat, though, so we can fool it into coming on multiple times thus eventually raising the temp. It’ll be a good day to do some baking to raise the temp, too. Glad you found a work around to keep comfortable Teri! The mechanic might not want to tackle fixing Tank again! When this misery is over, or maybe even before, I’ll be on internet trying to find out from others with the same vehicle where they get good service!